Meet Harry the moustache (or mustache)! He is a super sized stuffed stache, measuring about 20 inches long when using worsted weight yarn. This mustache amigurumi pattern includes step-by-step photos and you can contact me along the way to ask any questions. 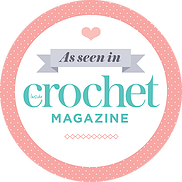 It is an easy level pattern that involves starting with a magic ring, single crochet, slip stitches, increasing, decreasing and attaching pieces.